Miss New Bedford Sara Achorn alongside several other Miss New Bedford competitors. NEW BEDFORD — Rochester native Sara Achorn has won the 65th edition of the Miss New Bedford pageant. Achorn, an 18-year-old freshman at Lesley University, won the crown over eight other contestants. Her win brought her a $6,500 scholarship. In addition, she won two other awards. The first, the Talent Award, was awarded to her as the highest-scoring talent act. Achorn sang “And I am Telling You,” from the musical Dreamgirls. The new Miss New Bedford also took the Miracle Maker Award, given to the contestant who has raised the most money for the hospitals involved in the Children’s Miracle Network. All eight contestants competed in several rounds. They answered an “Onstage Question,” performed a talent, and showed off their bathing suits and beautiful dresses in the swimwear and evening wear rounds. Achorn also won the Miss Plymouth County pageant in April, and was voted the “Most Talented Non-Finalist” in this year’s Miss Massachusetts pageant. With her win in the Miss New Bedford pageant, she is eligible to compete in next year’s Miss Massachusetts pageant as well. The Southcoast area is well represented with Jillian Zucco of Mattapoisett wearing the crown of Miss Massachusetts and local Sara Achorn of Rochester winning the Miss New Bedford title. It’s always exciting to watch one of our own achieving their dreams. Sara is definitely one to keep your eyes on in the coming years. Visit www.sippican.villagesoup.com for more local stories of achievements in our hometowns. Visit www.bbmpros.com for more local stories in our area and all the tools and tips to help your business fly and get noticed. Explore our webinars and one-day intensives to see if you can boost your business and bring into focus your business goals. This blog was posted on www.bbmpros.com on October 3, 2017. The kids are back at school and fall sports has begun. Field hockey, soccer, volleyball and football are just some of the fall sports offered at the local high schools. The teams have already been practicing for a few weeks and games are starting this week. Click on the link below for the Fall Sports Schedule at Old Rochester Regional High School. Come on out and support our young local athletes. Click on the links below each school to link to their fall sports schedules. Visit www.BBMPros.com for your local media company. We are your local experts and can help you get your business noticed. This blog was posted on www.bbmpros.com on September6, 2017. Sacred Heart Home Blood Drive will be held Tuesday, July 25th from 10:00 am – 3:00 pm. It will be held at the Sacred Heart Home Auditorium and sponsored by the American Red Cross. Every drop counts to save a life. Come on out and support a good cause and help save lives. Give blood and save a life. Visit www.bbmpros.com for more local stories and try their one day intensive to help you realize your business plans. Come on out and support this great fundraiser and enjoy good food and drink in the Southcoast. Visit www.boldmovesrealestate.com for more local events and a great team of BOLDIES who are experts in the Southcoast neighborhoods. This blog was posted on www.boldmovesrealestate.com on March 30, 2017. Debra Besse from Mercy Meals with our NO Shave November donation. Mercy Meals is always dedicated to helping the local community. Right now Mercy Meals is in need of mittens, gloves and hats! All donations can be dropped off at BOLD Moves Real Estate, 145 Fairhaven Rd. in Mattapoisett or at Mercy Meals located at 634 Purchase St., New Bedford, MA, between the hours of 5 AM and 10 AM. Help them help our local community and donate today! Visit www.boldmovesrealestate.com for more local news and a great team of realtors who are the local experts. This blog was posted on www.beyondboldmedia.com on February 7, 2017. Inspired by Sgt. Candido Trinidad of the New Bedford Police Department, the Pay-It-Forward Committee was formed to give back to those who do amazing things for those in need, the unsung heroes that dedicate their time, efforts and compassion to others. 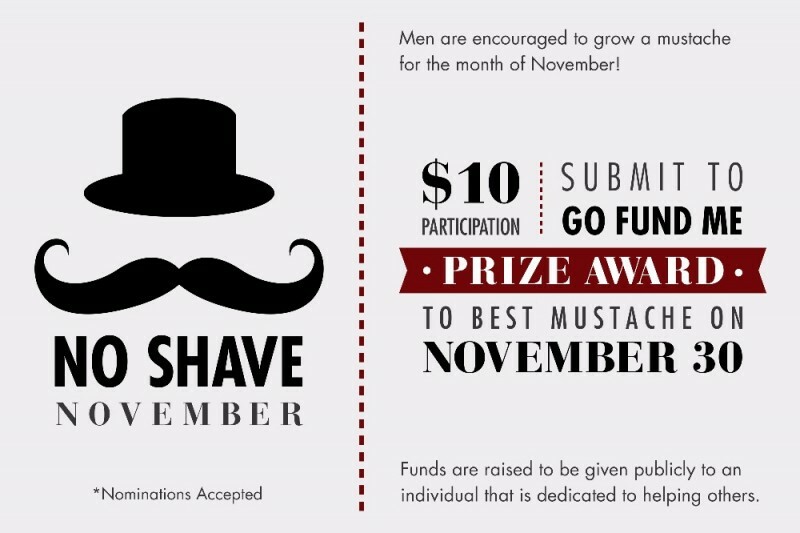 This month has been declared NO SHAVE NOVEMBER (sorry ladies, for those not accustomed to a little extra fur)! – On November 30, he who has the most likes WINS a prize! You are invited to submit nominations, to those you feel are most deserving. Recipients will be surprised, with the funds raised here and recognized LIVE for their efforts. Join BOLD Moves Real Estate and the Pay It Forward Committee and join the fun or make a donation. Visit www.boldmovesrealestate.com for great real estate and a great team of BOLDIES who can help you realize your real estate dreams. This blog was posted on www.boldmovesrealestate.com on November 7,2016.